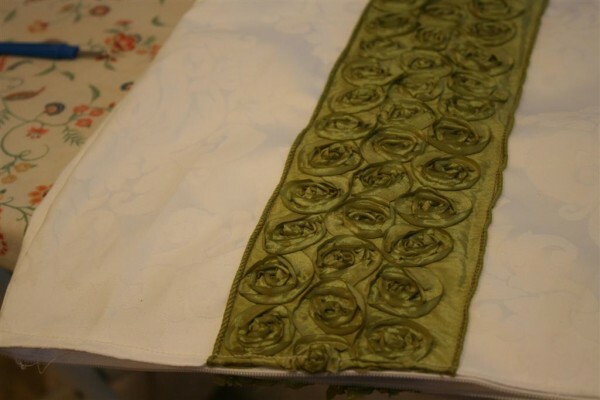 I thought I’d share the how-to’s for making your own ribbon embellished pillow. This will work even for wired ribbons. It’s such a fun, fast way to make use of gorgeous ribbon in your home decor. Since beautiful ribbon is often sold by the yard and can be pricey, it also allows you do to something beautiful with it without purchasing a large amount. The rosette ribbon I used is $8 per yard at a local shop. Luckily I got it on sale for $4, but since I needed less than a yard it was an affordable project at either price. To begin, measure your pillow form. Many of them have the dimensions printed on the tag or packaging. If yours doesn’t, measure it from corner to corner in both directions. Cut two pieces of fabric the exact same size as the dimensions of your pillow. 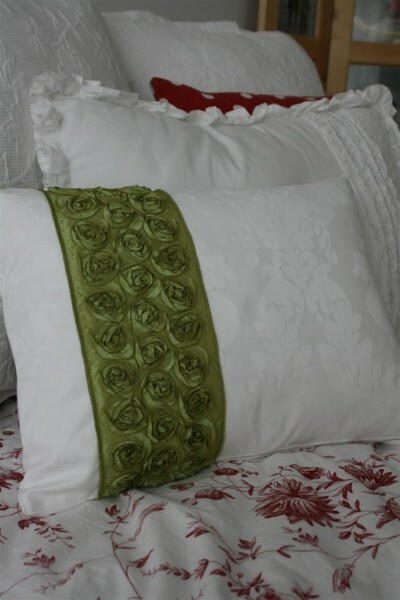 When I make pillow covers I don’t add seam allowances because I want the pillow to look plump and full. 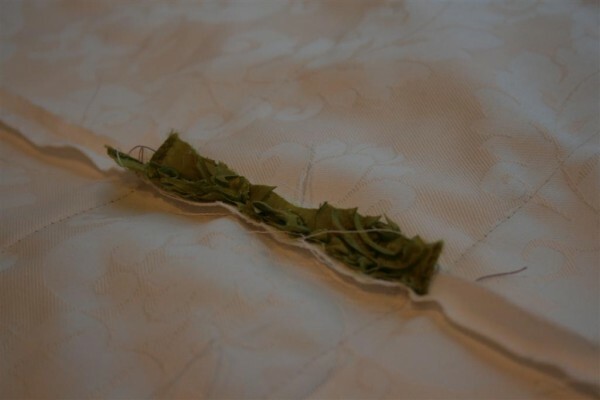 Cut two pieces of ribbon long enough to go down both front and back of your pillow. If you were stuck with less ribbon than you need, you could also make this pillow with ribbon only on the front, and a different fabric on the back. 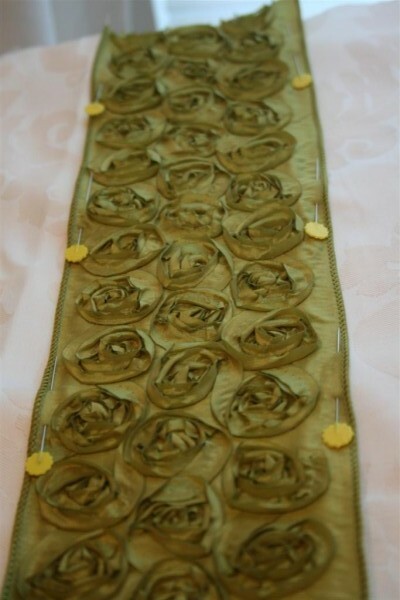 Decide where to place your ribbon on the pillow and carefully pin it in place. My ribbon was wired, so as I pinned I tried to straighten out the wire and make it lay flat and neat. MAKE SURE TO MATCH THE TWO SIDES OF YOUR PILLOW WHILE YOU’RE PINNING SO THE RIBBON WILL LINE UP NEATLY WHEN YOU SEW IT TOGETHER. 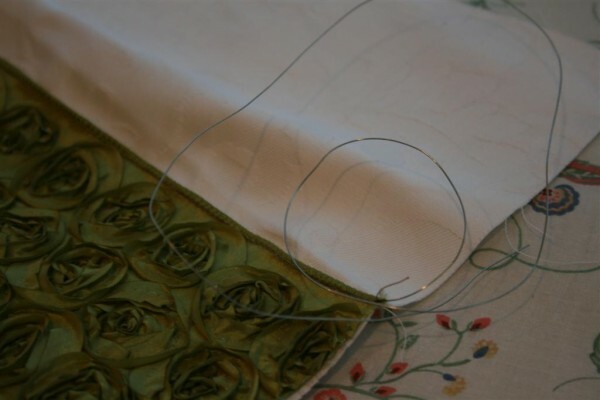 Carefully sew the ribbon onto the fabric, keeping your needle just inside the wired edge. Repeat on both sides of the ribbon, and also the other half of the pillow. Doesn’t it look pretty against the white? 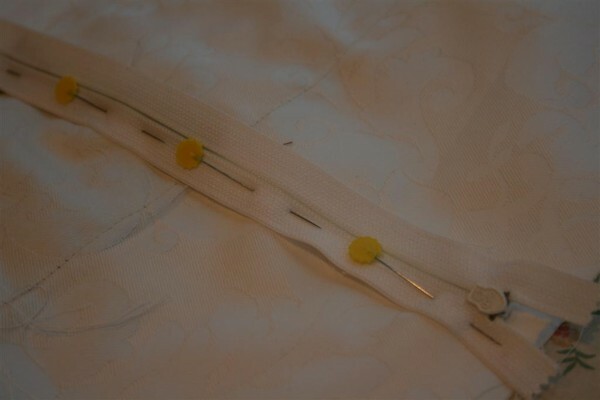 Now carefully pull the wire out of the ribbon so your pillow will be soft and flexible. Next comes the zipper! Line up the front and backs of your pillow cover with right sides together. Carefully pin them along the side where your zipper will lay. 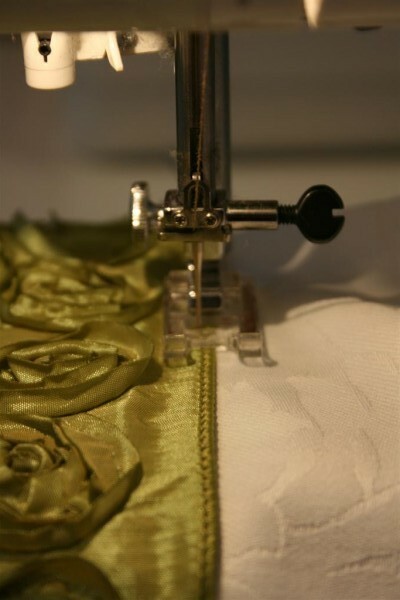 If the ribbon meets along this seam, be careful to line them up well and pin carefully in that spot especially. 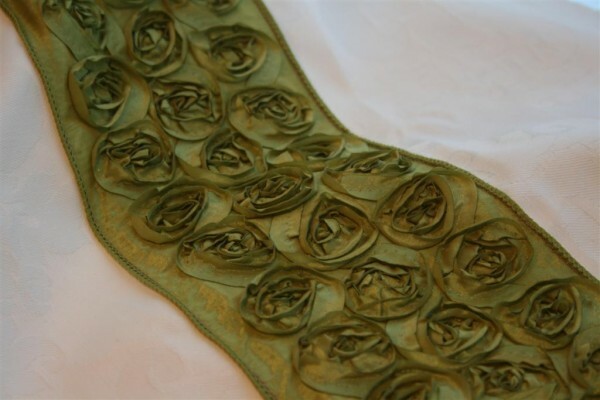 Sew along this edge with a 3/8 inch seam allowance. Carefully press open your seam. Carefully test your ribbon to see if it is safe to iron. Mine wasn’t (as in, I would have melted it if I’d ironed it) so I just finger pressed that part of the seam open. Now take your zipper and place it, right side down, on top of the seam you just pressed open. 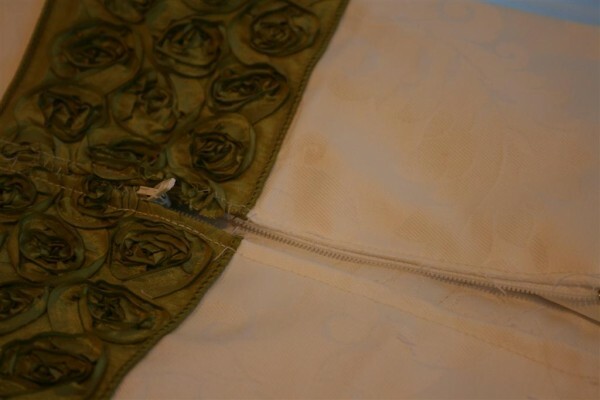 Carefully pin it in place, making sure to have the center of the zipper line up right on top of your seam. 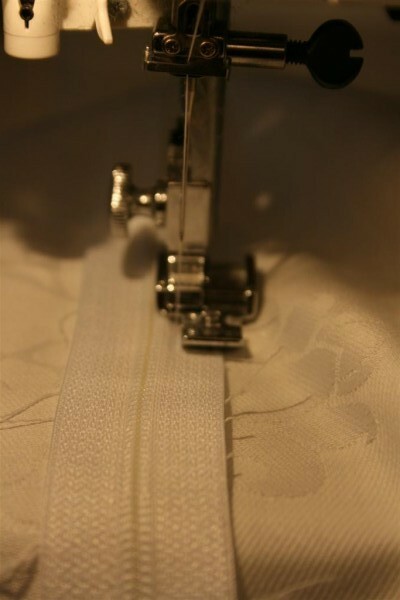 With a zipper foot on your machine, sew the zipper on top of the seam, going down one side and back up the other. It will look like you just sewed your zipper into a seam, making it appear useless. 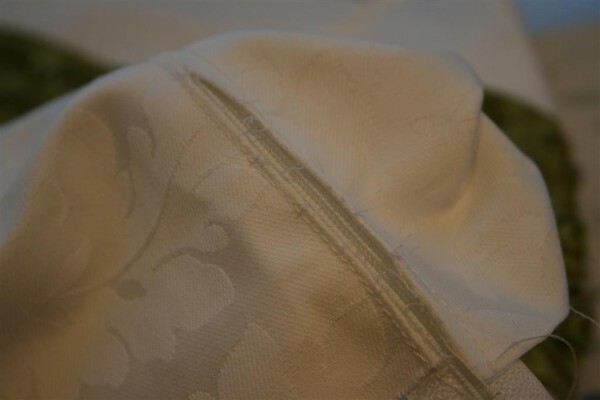 Once the zipper is sewn on, turn the pillow cover over, and from the right side, unpick the seam you made when sewing the two sides together. There, underneath the seam, is your zipper! 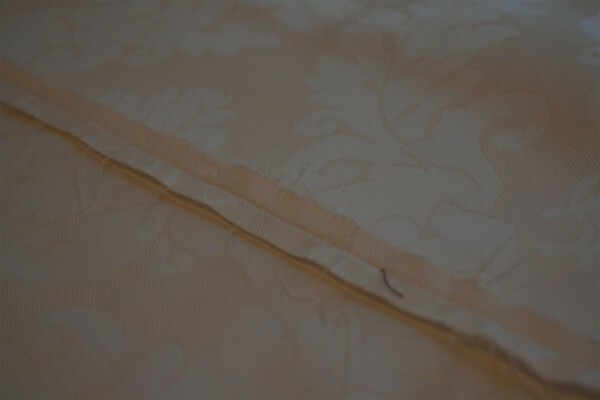 Continue down the length of the pillow, carefully unpicking the entire seam. Pull out the little broken threads after the seam is unpicked. Open your zipper at least far enough for you to get your hand through it. You’re almost done! 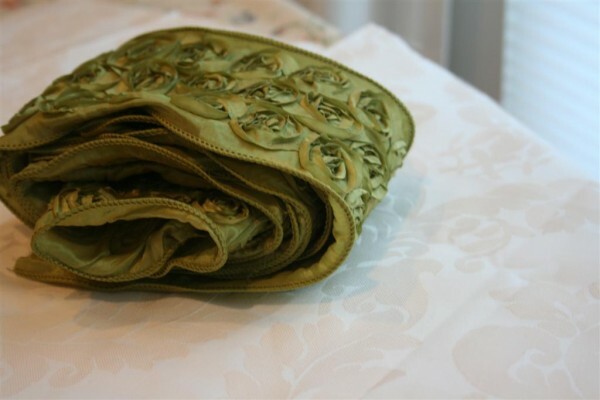 With right sides together, carefully line up the remaining three sides of your pillow cover and pin them together, again taking extra care to line up your ribbon. 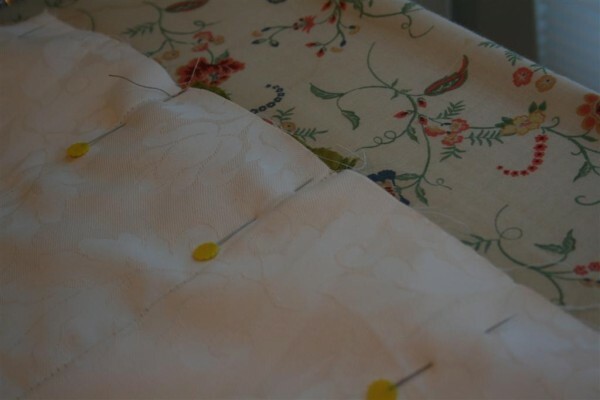 Beginning at one end of the zipper and using a 1/4 inch seam allowance, sew around all three sides of your pillow. Don’t forget to replace the zipper foot on your machine with your regular sewing foot! 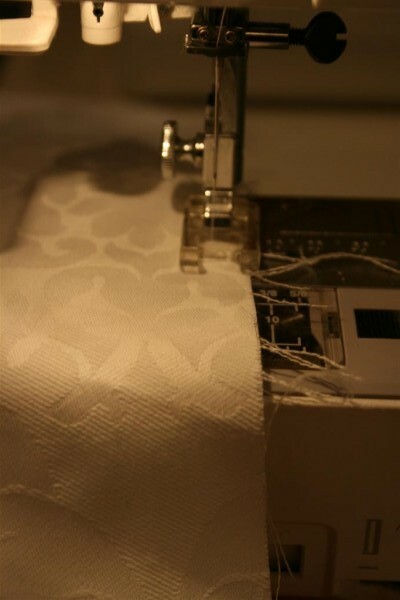 I usually put my machine on a zig zag stitch and go around those three seams one more time to help minimize unraveling inside the pillow. This is helpful if I like the pillow cover and use it long enough that it needs to be washed. Now trim any stray threads and turn the pillow cover right side out. Place your pillow form inside and zip it shut. You’re finished! Place it where you like and enjoy your one-of-a-kind pillow with gorgeous, expensive-looking detail! This project was simple and took less than an hour. Because I already had the pillow form, fabric and zipper it cost me less than $4.00 to make. I always use zippers in my pillows so I can change them often and store only the covers. I re-use the pillow forms all over my house. If you try making one, I’d love to see how it turns out! OK… When is our next craft day? hopefully soon my hopeful homemaker friend. This is so pretty. I saw it on Craftaholics gift exchange blog. Thanks for putting the tutorial up.